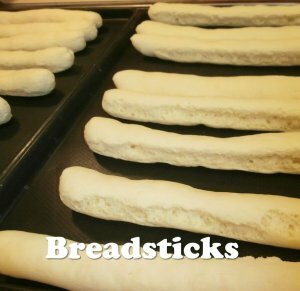 These gluten-free breadsticks are warm, and delicious. They are free of gluten, dairy and yeast, and are reminiscent of French bread. Either place all ingredients in a food processor with the dough-kneading blade, or place them in a bowl. Roll the dough into a long log. Break it in half and keep rolling and dividing it in half, until you end up with sticks of dough that are about half an inch thick. I usually make them about 9 inches long, but you can make them whatever length you like. Place the sticks of dough on a cookie sheet, with a little space around each one so that they have room to expand as they bake. They will end up two to three times wider. Serve with your favorite butter-like spread.